Holiday hosts rejoice! Veteran Courier-Journal Food Editor Sarah Fritschner has come to the rescue of every cook and hostess who faces a season of family, friends, and parties during the fall holidays. 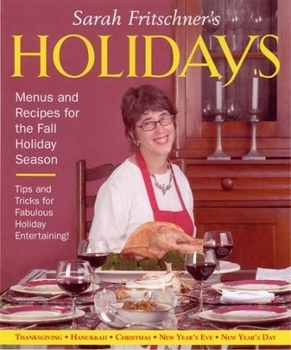 Her time- and tradition-tested menus and recipes provide the blueprints that will help you entertain and sustain family and company from Thanksgiving through New Year's Day. Here you'll find what you need, from the basics of making gravy and mashed potatoes to throwing an elegant New Year's Eve party with champagne cocktails and beef tenderloin snacks. From holiday brunches to tree-trimming parties, Sarah Fritschner's Holidays offers casual menus to suit every holiday occasion. Sarah Fritschner is the Food Editor of the Louisville Courier-Journal and an authority on the southern-influenced foods of Kentucky, especially those associated with the Kentucky Derby. She is a frequent guest on regional food and cooking television shows, and a popular speaker and teacher of culinary techniques. In addition to her Butler Books titles, she is the author of the multi-volume "Fast Lane" series of cookbooks for Houghton-Mifflin.